Welcome to The Slide Inn. 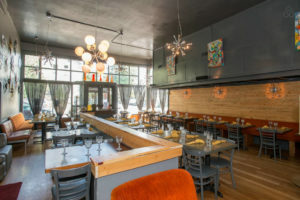 A corner gathering spot serving Modern American, German favorites with Italian and global flair. Our menu is designed for those seeking Gluten Free, Vegan, at the same time we also cater to those seeking Meat options and of course our house smoked sausages and house made sauerkraut!. We are all inclusive focusing on house made freshly prepared foods! You can sign up here for the Thursday show, sets are between 3-5 minutes. Serving Dinner 5:30 pm Tuesday – Saturday. On Sunday we open our doors at 7 pm with our all night happy hour, we also feature a free Comedy show that starts at 8 pm. We do recommend that you contact us in advance in case we have a private event booked. If you are planning a private event or would like to find out if we are open to the public that night please check out our Events Calendar, please note that some events will be listed as Jade or Slide Inn. Also note some events are daytime versus evening. Set in an inviting mid-century modern inn, you’ll find a creative blend of talent from husband and wife team Eugen & Lenor Bingham. Serving dinner Tuesday-Saturday from 5:30 pm on, Sunday 7 pm on. Brunch is served Saturday and Sunday from 9:30-2 pm. We feature a wide variety of all-natural meat, vegan, gluten free and vegetarian options. We are committed to preparing as many of our food offerings in house as possible and go through great lengths to do so. Some of our products include our house-baked breads, gluten free breads, and house-smoked sausages as well as our house-fermented sauerkraut. We feature an onsite Organic Garden where we harvest from early spring until late winter. If you have an upcoming wedding, all-day meeting, baby shower, cocktail party, luncheon, breakfast, etc., we would love to host your event at either The Slide Inn or at our adjoining space, Jade Lounge. Contact Us today for pricing! We also offer Catering both on premises and off-site. A Big Thank you to NPR and Here and Now! We recently got a surprise phone call from National Public Radio with the chance to be interviewed on National Radio! For our newest Brunch review, please check this out! Check out some reviews: TripAdvisor’s 5 Star rating, The Oregonian, or our newest Thrillist sausage review! Check out “The Slide Inn” on the hit NBC show “Grimm” – Watch a clip here! Watch a segment on KGW Channel 8, “Digital Dining”. You can now purchase our exclusive syrups, made here in house! The Slide Inn All-Natural, House-Made Syrup – Flavors Include: Hibiscus, Chocolate, Salted Caramel, Coffee, Vanilla, Ginger, Lavender.